Some of the most challenging problems in science and engineering are being addressed by the integration of computation and science, a research ?eld known as computational science. Computational science plays a vital role in fundamental advances in biology, physics, chemistry, astronomy, and a host of other disciplines. This is through the coordination of computation, data management, access to instrumentation, knowledge synthesis, and the use of new devices. It has an impact on researchers and practitioners in the sciences and beyond. The sheer size of many challenges in computational science dictates the use of supercomputing, parallel and distri- ted processing, grid-based processing, advanced visualization and sophisticated algorithms. At the dawn of the 21st century the series of International Conferences on Computational Science (ICCS) was initiated with a ?rst meeting in May 2001 in San Francisco. The success of that meeting motivated the organization of the - cond meeting held in Amsterdam April 21-24, 2002, where over 500 participants pushed the research ?eld further. 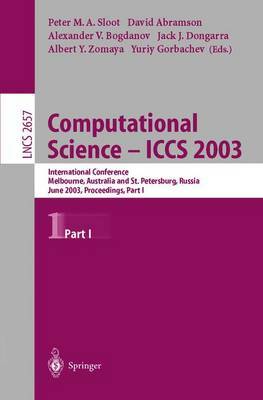 The International Conference on Computational Science 2003 (ICCS 2003) is the follow-up to these earlier conferences. ICCS 2003 is unique, in that it was a single event held at two di?erent sites almost opposite each other on the globe - Melbourne, Australia and St. Petersburg, Russian Federation. The conference ran on the same dates at both locations and all the presented work was published in a single set of proceedings, which you hold in your hands right now.